Return samples drawn from a log-normal distribution. Draw samples from a log-normal distribution with specified mean, standard deviation, and shape. 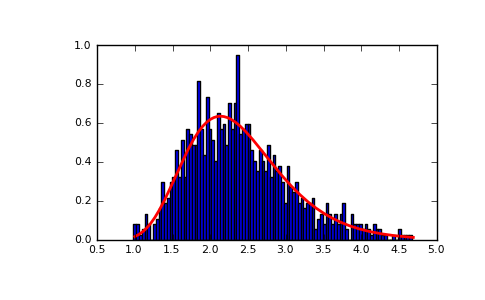 Note that the mean and standard deviation are not the values for the distribution itself, but of the underlying normal distribution it is derived from. 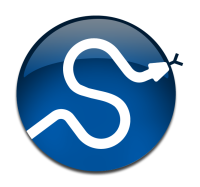 Output shape. If the given shape is, e.g., (m, n, k), then m * n * k samples are drawn. probability density function, distribution, cumulative density function, etc. A variable x has a log-normal distribution if log(x) is normally distributed. where is the mean and is the standard deviation of the normally distributed logarithm of the variable. 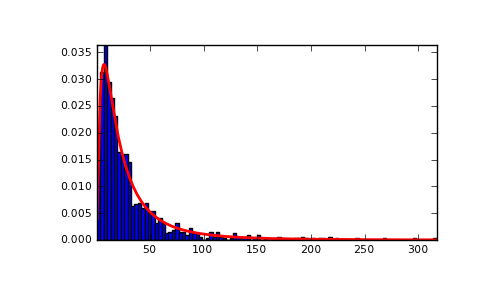 A log-normal distribution results if a random variable is the product of a large number of independent, identically-distributed variables in the same way that a normal distribution results if the variable is the sum of a large number of independent, identically-distributed variables (see the last example). It is one of the so-called “fat-tailed” distributions. The log-normal distribution is commonly used to model the lifespan of units with fatigue-stress failure modes. Since this includes most mechanical systems, the log-normal distribution has widespread application. It is also commonly used to model oil field sizes, species abundance, and latent periods of infectious diseases. [R165] Reiss, R.D., Thomas, M.(2001), Statistical Analysis of Extreme Values, Birkhauser Verlag, Basel, pp 31-32. Demonstrate that taking the products of random samples from a uniform distribution can be fit well by a log-normal probability density function. >>> # values, drawn from a normal distribution.